SPE stands for Solid Phase Extraction, which is a form of "digital chromatography" meaning it works in an on/off manner, compared to regular liquid chromatography where the elution on the peaks or components occurs gradually. SPE uses a sorbent that has a strong affinity for the desired compound and solvent changes to collect the individual components as single fractions rather than gradient elution used in normal chromatography which yields multiple fractions of the same component. After applying the sample to a pre conditioned column, the column is eluted with a solvent that has a weak affinity for the desired product to removed impurities. It is then eluted with a solvent that has a strong affinity for the desired product thereby displacing it from the sorbent. This makes SPE easily applied to automation. Common SPE formats include syringe barrels type and 48, 96, 384 well plates. What type of SPEs do you offer? We offer a variety of SPE formats, mainly pre packed barrels in a variety of sizes from 1ml to 377ml. 48, 96, 384 well plates are also available. In terms of sorbent, any type of silica or functionalized silica that we offer are available for packing. Please see the SPE section of our site for more information. How to choose the SPE sorbent? For standard types of SPE, you need to consider two things: the solvent (aqueous or non aqueous) and the mechanism of interaction (polar, non polar or ion exchange). Then, consult the SPE flow diagrams to make your selection. If you are interested in using a scavenger in SPE, you should consult the scavenger selection guides: one specifically for the removal of metals and the other for more general scavenger. How do select the SPE size? There are no strict rules for selecting the size of SPE. SiliCycle sorbents have a higher loading than comparable silica based material from other manufacturer. For organic and metal scavenging applications, we recommend using at least a 4 fold excess of SiliaMetS® / SiliaBond® Metal Scavenger. 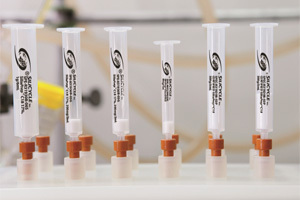 The sample volume should be kept small; ideally it should be completely adsorbed into bed (approximately 120 µL per 100 mg). Residence time is the key for a good scavenging efficiency.